It's the day when we remember those who fought for the cause of freedom. Our freedom, by standing up and coming along side of those in need, for the cause of their freedom. Even if war wasn't fought on our shores, WW1 and WW2 represented threats to us, even here in N. America. Here in Canada. Had WW2 ended differently, European countries would probably not be speaking their native tongues. Who knows? Even here in Canada, we may have no longer been speaking English, had Hitler and his crew of Nazi's won the European front. He may have then chosen to proceed in fulfilling his desire of conquering the world. The above pic is the facebook (FB) profile photo I have chosen to use to remember, this year. 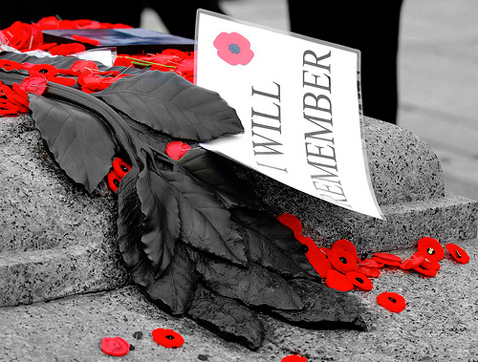 It shows a poppy, with words beneath, Lest We Forget. Poppies grew in Flanders. With the popularity of John McCrae's poem, the poppy became the symbol of Remembrance Day, for the countries of the allied forces. The poppy is meant to be worn on the left lapel or side of your clothing, symbolizing being over your heart. It was amazing to me when I was recently asked by a FB friend what my profile pic was. When I explained the poppy and what it meant, the person was surprised. Actually, it made me realize that not everyone in this generation knows and understands that the freedom we enjoy, here in Canada, USA or any other free country, was not free. It came at a cost. Freedom came with sacrifice. The ultimate sacrifice being paid by those who gave their lives fighting for my freedom and yours. Of course, those who did not die during battle also sacrificed themselves, being separated from friends and family, and risking their lives for us. As did those who had loved ones who fought the battles on our behalf. Many of you who either know me personally or have read Life with Lynnie (LwL) for a while, will know that both my parents were veterans of WW2. My dad serving in U.K., France and Belgium, with the Canadian Army. My mom serving in Washington, D.C., USA, with the Canadian Women's Army Corp (CWAC). Today, is a rather unique time to celebrate Remembrance Day, for it is always celebrated on November 11th, with services traditionally being held at cenotaphs and other places, at 11:00 a.m. This means that this year Remembrance Day services were held on 11/11/11 at 11 a.m. This was a once in a lifetime occurrence, for my life, or yours. This year, I did not attend my local service, but rather, watched our national service on television. 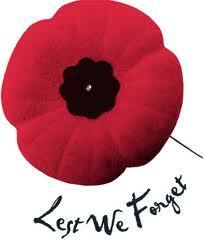 Please take the time to honour our surviving veterans and those who gave their lives for you and me. Wear your poppy. Tell veterans and our military personnel that you appreciate their efforts. I'm sure they will appreciate your support. May God bless them. And, may God bless you.